I picked up this meditation book the other day called, "Journey into healing", which I found described how to meditate in a very easy to learn way. I'd thought I'd share it some of their tips as well as my own. I hope you find it useful, particularly if you were thinking about meditating or trying again if you haven't been able to successfully meditate yet, as it can be a bit tricky to get started. Find a comfortable place to sit - You can start by sitting comfortably in a quiet place where you will have a minimum amount of disturbance. Some people find it easier to lie down and meditate you can do so also but you’ll need to make sure you don’t fall asleep. 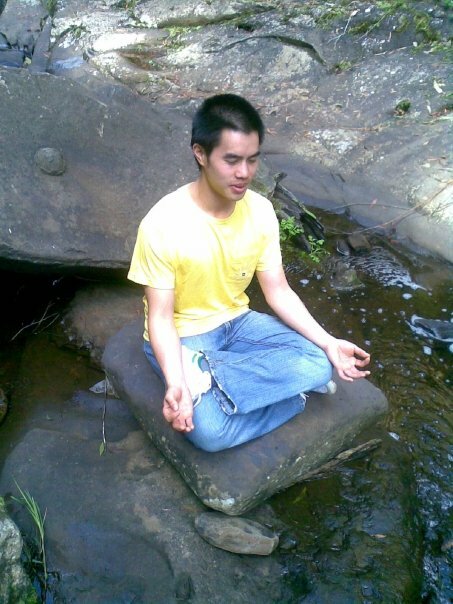 Later on with practice you may find that you may be able to meditate anywhere. Close your eyes – While closing your eyes is not essential, doing so will help you to stay focused as you will won’t be tempted to observe possible distractions. Observe your breathing – Observe your breathing while trying not to control or alter it in any conscious way. Gently keep your attention on your breathing – Now as you keep doing this you will notice that your attention drifts away from your breathing and you are thinking about other things or listening to noises around you. When you notice this, gently bring your attention back to your breathing. Meditate and come back to normal slowly - Once you’re comfortable for the duration of your meditation, say 10-15 minutes. Spend another couple of minutes allowing yourself to slowly come out of the meditation and open your eyes fully. Feeling of boredom or restlessness and your mind may become filled with thoughts – This may indicate that there are deep inner stresses and emotions that are being released from your system – as you meditate you may find it helps you to begin to clear them from your mind and in turn, its effects on your body. You may fall asleep during meditation – This may mean that you need some more rest. You may slip into the “gap” - This is when the breath becomes very settled and feels more comfortable, and you have found that you’ve slip into the gap between your thoughts. You may find yourself unaware (blocking out) sounds and the world around you. This is where you want to be as your mind is free from the general everyday disturbances. Practice often - Once you feel you've mastered the initial step of meditating you can start meditating more regularly and for longer, and may find that you feel much calmer and relaxed as a result. Some people suggest that you meditate twice a day, once in the morning and again in the afternoon. While this is great, please make sure that you are generally enjoying the benefits of meditating and that it doesn't become a chore (otherwise, like most things, you may find it ineffective for you). Use techniques to enhance your meditation - There are different postures and gestures that you can use while meditating that simulates different aspects of meditation, this includes changing the way you breath (such as breathing more from your upper chest, or deeper breathing). I'd say try as many styles as possible and then select the few that you are most comfortable with. Meditate in a way that's comfortable for you - I sometimes meditate in the full lotus position and often create a chi energy ball (see chi bending), but not always. Sometimes I meditate in the half lotus position, or even while just sitting down on the bus or on the plane, essentially when I may be feeling anxious. With practice and concentration, you'll find that you can meditate anywhere and anytime you wish.